Welcome to Gymnastics Palace! Please complete the following registration form. As a new customer you are allowed 1 free trial class. If you don't show up or you don't reschedule minimum 24 hours in advance by text or email, you will loose that opportunity and will have to pay a discounted rate of $10 per trial class at the time of scheduling. There are no make up classes available for missed trial classes. If new customers want to try a different class, they must pay the discounted rate of $10 per class at the time of scheduling. Returning customers are allowed 1 free trial class if they were inactive for more than 6 months. Current customers may take a trial class for another program at the discounted rate of $10 per class with all the above rules in force. As a courtesy, we allow two make-ups per month. To be eligible for a make-up class you must notify us that your child will be absent by text or email minimum 24 hours ahead of the missed class. You must pre-register for make-up classes. You have maximum of 20 days to schedule and complete your make up class. We do not offer make-up classes for missed make-up classes. If you need to drop from a class or change classes, you must email or text us before the 25th of the month prior to the change. You can also make these changes via your Customer Portal on our website. If you don't follow this policy, you will be responsible for the next month's tuition, which is automatically billed on the 25th of the month. We do not offer credit and/or refunds for cancelled classes due to holiday, vacation, illness, weather or any other reason. If you would like to make up a class, please refer to our Make Up Policy. Unused, unworn merchandise may be returned within 30 days for a full refund, exchange or store credit. The item must be in perfect condition with all the tags and labels attached. Payments are made monthly and you don't have to worry about your spot being taken. You are guaranteed your spot all year long, as long as you don't withdraw and fees are up to date. Customers can join a class at anytime, as long as there are open spots in the class. We will pro rate the tuition accordingly. Tuition is not prorated for absences. Please see the class Make-Up Policies. **Once enrolled in a class, each family is required to have a credit/ debit card or bank account on file for payments. (Does not apply for a trial class). Tuition is due and will be charged automatically on the 25th of each month for the following month. If payment is made prior to the 25th of the month by one of the options listed below then no fees will be charged to your credit/ debit card on file. Payments may be made in person with cash. Payments may be made with a personal check. 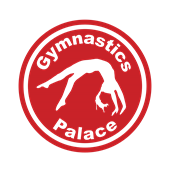 Please make your check payable to Gymnastics Palace and please note the student's name, class, day and the time on the memo portion of your check. A $25 fee will be assessed on all returned checks. Once we have received a bad check, all future tuition must be paid with cash or credit/debit card. Payments may be made with VISA, MasterCard, or Discover. Remember, any remaining balances on the 25th of the month will be charged to your credit/ debit card on file. If there are changes to your credit/debit card the new information must be received before the 25th of the month. If your payment doesn't go through for any reason you will be charged a $10.00 decline fee. If delinquent tuition is not paid before the first of the month, your child(ren) will be tagged inactive by the computer, will be un-enrolled, and children on the waiting list will be called.